The Belgian Malinois is a highly intelligent breed famed for its accomplishments as a police and military dog. In these roles the Malinois is an expert narcotics and explosives detector, a fearless scout, and an unyielding protector. As one might expect, this breed is hard-working, intense, and very loyal. It is a breed that yearns to be challenged physically and mentally. Not for the novice owner, the Belgian Malinois needs a firm yet compassionate leader who is willing to spend time with his or her dog each day. Training and socialization are a must for a well-rounded dog, and taking the dog out for strenuous exercise is very important. Though this breed may be a load of work, owners will tell you that having such an intelligent and loyal dog around is in every way worth it. Below are details and facts for the Belgian Malinois dog breed. 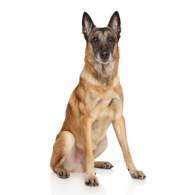 The Belgian Malinois is considered a medium sized breed. Adult males average a height of 24 - 28 inches and weigh between 65 and 75 pounds. Adult females will stand 22 - 24 inches tall and weigh between 55 and 65 pounds. 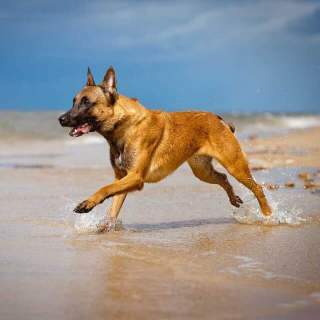 Strong and well-built, these robust dogs are highly versatile and excel in a wide variety of roles; as an agility competitor or a guard dog, there are few breeds that can outmatch the Belgian Malinois. The Belgian Malinois is loyal and terribly smart. These dogs continue to excel in a number of roles and remain one of the most popular dogs in military service across the globe. Originally bred as working dogs, Malinois' are very energetic and demand an owner who can keep up with their energy level. Though unaggressive, these dogs are highly sensitive and have an intense disposition. A properly trained and socialized Malinois should be a gentle creature and watchful of children, but children should also be made to understand that these are not dogs to shout at or mess with while eating. This breed is medium to high maintenance. Grooming this breed is fairly simple; brushing a few times a week will keep the coat healthy, and they shed an average amount. Exercise needs for the Belgian Malinois are above average. A short walk is not enough to properly exercise this dog. Being a working breed, they will require at least an hour’s worth of strenuous exercise to be at their best both physically and mentally. In the 1800’s, four varieties of herding dogs were common around the Belgian countryside. Belgian sheepherders bred these dogs to be obedient and hardworking farm workers; as dog shows became fashionable around Belgium these dogs were often brought out to compete in various contests. In 1891, a veterinary professor by the name of Adolphe Reul discovered that some of the Belgian herding dogs were noticeably different than the other dogs (collectively known as Chiens de Berger Belge) in coat type and color. Reul found out that these short-haired and fawn colored dogs were being bred in the city of Malines, and in 1892 he wrote the first standard for the Belgian Shepherd Dog. In 1911 the Belgian Shepherd was recognized by the American Kennel Club. During the pandemonium of World War I, breeding efforts were severely hampered, and the breed narrowly escaped extinction. Just as the breed was beginning to flourish, World War II broke out, and Belgian Shepherd dogs were recruited into military service en masse, once again depleting their numbers. These intelligent dogs played an important role, however, as scouts, messengers, and patrol dogs in the Allied armies. In 1959 the American Kennel Club decided to split the Belgian Shepherd Dog into separate breeds, and in 1965 the Belgian Malinois was awarded full AKC recognition as a working dog. In 1983 they were moved into the herding group where they remain today. Though the Malinois is not extremely popular among Americans, it has gained fame and recognition recently for its exploits as a military dog—a Malinois was part of the team that captured Osama Bin Laden—and as the breed used by the Secret Service, and many people expect to see more Belgian Malinois amongst American families in the years ahead. The Belgian Malinois is a robust and sturdy dog of good proportion. It is square framed with a mostly level topline, which stands in contrast to the German Shepherd, which has a rectangular frame with a sloping torso. These dogs stand proud and erect; a Belgian Malinois is a formidable dog with an air of dignity about it. The coat is short, straight, and weather-resistant, meaning it can repel water and frost, allowing the dog to stay warm. The hair around the neck is usually slightly longer than on the rest of the body. Belgian Malinois have a skull that is roughly equal in width and length. Their powerful jaw is lined with scissor-like teeth that can bite at approximately 1,400 pounds per square inch. The ears are large, pointed, and almost always stand erect, giving the dog a very alert appearance. Their almond-shaped eyes are dark brown. The tail is thick at the base, tapering slightly. Some dogs have a tail that is held up and curls forward over the rump while others carry their tail down. According to the American Kennel Club, the standard colors for this breed are fawn, fawn sable, mahogany, red, and red sable. A black mask is permitted as a standard marking. Other non-standard coat colors include black, brindle, cream, cream sable, gray, gray sable, and liver. The Belgian Malinois is considered a medium sized breed. Adult males will generally reach a height of 24 - 28 inches and weigh between 64 - 75 pounds. Females will stand 22 - 24 inches tall and weigh between 55 - 66 pounds. The Belgian Malinois, as evidenced by its use in police forces and militaries across the world, is an extremely capable and intelligent dog. They excel in just about every dog sport and competition - this breed consistently does well in events such as Schutzhund, agility trials, obedience competitions, and search and rescue, among other things. As far as watchdogs go, you can't find a dog better than the Belgian Malinois. Though bright and willing to learn, the Belgian Malinois is a dog that will require an owner willing to commit time to his or her dog, especially when it is young. The Malinois is protective by nature and needs a lot of socialization to learn that people and animals approaching “his” territory are not threats. These dogs require a master who can establish him or herself as the pack leader, is consistent and firm, but does not resort to harsh punishment. This is a sensitive and discerning breed - owners who the Malinois judges to be unfair will be rewarded with uncooperative behavior. This breed is very demanding and many inexperienced owners find that it is too much for them to handle. Socialization and training is especially important with this breed. Ideally, the puppy should be meeting new people and dogs on a daily basis. Puppy obedience classes are an effective way to achieve this end while teaching the dog valuable lessons. 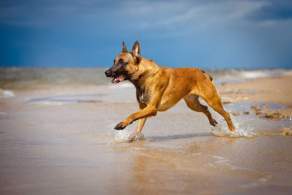 Though the Malinois benefits greatly from time spent off-leash, care should be taken to let this dog run when small animals are present, as they may run off chasing a squirrel or cat. If properly socialized, however, the Belgian Malinois can live peacefully around cats and other animals. This dog has bountiful stores of energy and should be exercised multiple times a day if it is not performing some kind of job. Under-stimulated dogs may resort to unwanted behaviors such as chewing or digging. They may also resort to such behavior if left alone for too long. These dogs form strong bonds with their family and will be unhappy if neglected. Belgian Malinois should not be left outside or kenneled for long periods of time. This breed is not for everyone. 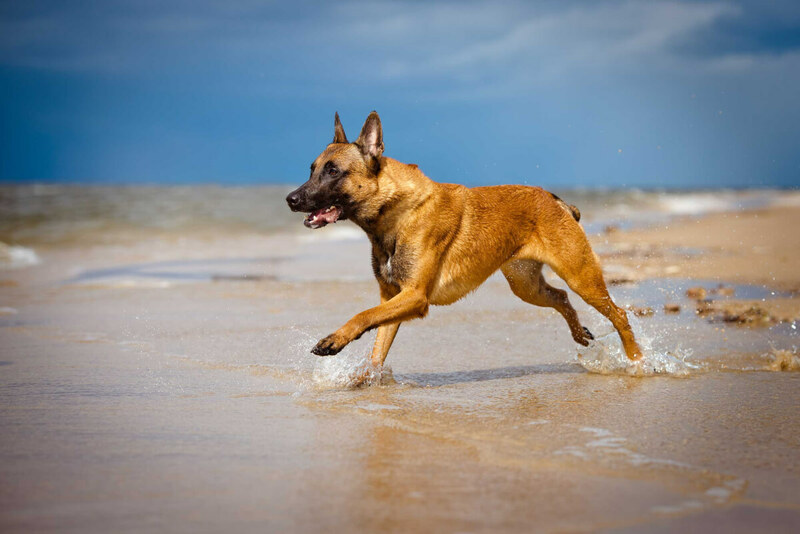 But for owners who can establish themselves as a leader, challenge their dog both mentally and physically, and wish to welcome their dog into the family home, the Belgian Malinois will be an immensely rewarding and loyal pet. Though a properly trained and socialized Malinois is affectionate and gentle with children, having a Malinois is like adding another child to your family; this dog requires a great deal of attention and stimulation in order to reach its full potential, and those raising young children will want to carefully consider whether they have the time to devote to this breed. Socialize this dog with children early in its life, and make sure it understands that jumping on people is not okay. The Malinois can live amicably around other animals, but for best relations it needs to be socialized with other pets early in life. It has a strong prey drive and may look at small non-canine pets as animals to chase and potentially attack if not introduced properly. These dogs also tend to display dominant behavior towards other dogs. The Malinois should be taught by its owner that dominant behavior is unwanted. Taking your Malinois to a dog-obedience school is a good way to introduce it to other dogs and begin to cultivate a sociable personality. These dogs are known to be somewhat reserved around strangers owing to their natural protective instincts. Being very intelligent, however, a Malinois will grasp whether a stranger is wanted or unwanted rather quickly. That said, it is highly recommended that these dogs be socialized with new people as much as possible when they are puppies. Below are pictures and images of the Belgian Malinois. This is a medium-high maintenance breed. Though grooming needs are fairly standard, the Malinois is a high-energy working dog that will require a great deal of exercise and stimulation in order to be a happy camper. This is not the kind of dog for an owner whose idea of exercise is a relaxed stroll around the block - the kind of exercise this dog needs are strenuous and ideally mentally challenging as well. The smooth, shorthaired coat of the Malinois is easy to groom. Brush the coat a few times a week with a firm brush in order to remove dead hair and keep the coat from getting matted. These dogs should not be bathed unless it is absolutely necessary, because soap removes the weather-resistant properties of the coat. This breed does tend to shed lightly throughout the year, and heavily twice a year. A vacuum to remove dead hair from the floor is definitely a good idea. Nails should be clipped if the dog does not wear them down on its own. If the nails can be heard clicking on the floor, then they are due for a clipping. The dog's teeth should be brushed at least twice a week, if not more. Both of these tasks will be much easier if the Malinois is accustomed to them when it gets to be an adult. Start these practices early in its life to ensure this is the case. Anyone considering adopting a Belgian Malinois should be prepared to commit a good chunk of each day to exercising their dog. As an active herding breed the Belgian Malinois should be exercised for at least an hour and a half each day; intervals of 20-30 minutes spread out over the course of the day are a good way to achieve this level. Having access to a location where these dogs can spend time off leash is very helpful. There are few activities this breed does not enjoy. Many competitions have been won by these dogs, and training for obedience or agility trials is a rewarding task for the Malinois, but they'll be just as happy to accompany their owner on a hike or a run. Some owners report that a Belgian Malinois can live in an apartment, but it will require a steadfast commitment on the part of the owner to giving the dog the exercise it needs. A house with at least a medium sized yard is ideal, as it will give the dog room to run freely and a space to call his territory. Wherever the space, it is important that the dog be allowed access to its family - it will suffer if left outside or otherwise neglected. These dogs are versatile when it comes to the climate. Their double-coat gives them protection in cooler weather, but they can adapt to warmer climates as well. 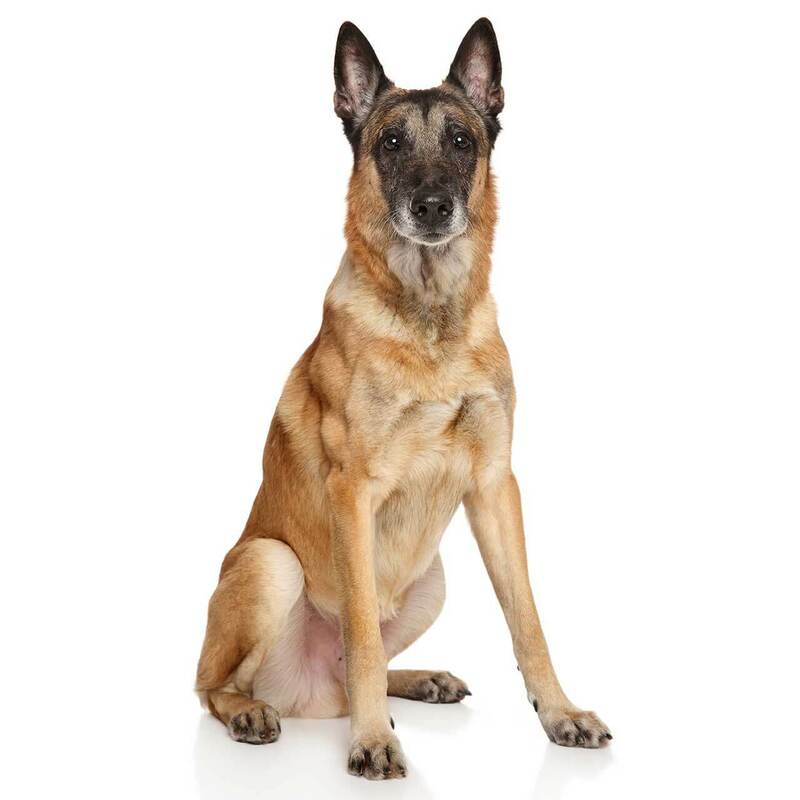 Owing to its history as a working dog bred at very high standards, the Belgian Malinois is considered one of the healthiest breeds, however there are a small number of individuals prone to hip and elbow dysplasia, eye problems, and epilepsy. If you are considering adoption, it is wise to consult with a breeder who will show you health clearances for the puppy's parents. Generally speaking, the Belgian Malinois is very robust and should not injure easily. The life expectancy for this breed is 10 to 12 years.